The world's most wanted man, Osama bin Laden, appeared in a videotape Thursday, calling for the destruction of the U.S. economy as the surest way to bring down America. 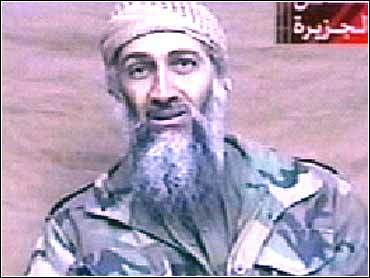 Looking gaunt but smiling occasionally, the terrorist leader appeared in front of a brown cloth, dressed in military fatigues. Though thinner than in past tapes, his voice was strong and clear. He spoke deliberately, often leaning into the camera. "I concentrate on the importance of continuing holy war actions against America, militarily and economically, and America is retreating with God's help," he said in a videotape sent anonymously by air courier from Pakistan to Qatar-based Al-Jazeera television, which aired it in full Thursday night. In the past, Osama bin Laden has used personal couriers to deliver his videotapes pitching Death to America and whatever other messages he may have on his mind. This time, he used the express package delivery service DHL, according to a television executive quoted by The New York Times. Abrahim Helal, an al-Jazeera executive, told the newspaper that the tape did in fact come via DHL. He didn't say whether there was a return address but an American official interviewed by the paper notes that it wouldn't be hard for someone acting on behalf of bin Laden to put a false return address on the package. It reportedly came from a DHL office in Pakistan. In an apparent appeal to Muslim youths, bin Laden repeatedly referred to the 19 hijackers who carried out the Sept. 11 attacks on the World Trade Center and the Pentagon as martyrs. He said they "struck deep in the heart of America's economy." The tape has raised new questions about where bin Laden is or if he is alive. A spokesman for Afghanistan's new defense ministry said bin Laden was in a border area of Pakistan. Other Afghan officials said his whereabouts were unknown. In Washington, U.S. Defense Secretary Donald H. Rumsfeld said experts would examine the tape for any valuable intelligence information on bin Laden. He admitted the United States did not know where the al-Qaida leader was. "We hear six, seven, eight, 10, 12 conflicting reports every day" on bi Laden's location, he said. U.S. forces have been searching caves in the mountainous Tora Bora area of eastern Afghanistan, where bin Laden's al-Qaida fighters made their last stand. Al-Jazeera began broadcasting excerpts of it Wednesday night and aired it in full Thursday. The channel said bin Laden's videotape was mailed from Pakistan but had lain unopened on a secretary's desk for two days before someone noticed it Wednesday. Al-Jazeera did not say how it got the tape or when or where it had been shot, though the channel's anchor said it could have been recorded in the Muslim holy month of Ramadan as bin Laden was swallowing constantly. Muslims refrain from eating and drinking from dawn to dusk during Ramadan which ended on Dec. 15. Bin Laden gestured often during the 33-minute tape with his right hand and kept his left arm at his side. He is believed to be left-handed and it wasn't clear if he avoided using that hand because of a problem or injury. Bin Laden often has been shown gesturing with his right hand. Prince Bandar bin Sultan, the Saudi ambassador to Washington, quickly issued a statement in the United States saying the tape "contains the usual rhetoric we have seen before from a deviant and cowardly criminal. Bin Laden is deluding himself if he believes that his criminal acts are justified by any religion or principle of humanity." Saudi Arabia stripped bin Laden of his citizenship nearly a decade ago, when his anger with warm Saudi-U.S. relations grew loud enough to become a potential threat to the stability of the monarchy. Aboard the USS Theodore Roosevelt aircraft carrier, which is launching airstrikes on bin Laden's suspected hideouts from the Arabian Sea, the crew watched footage aired by CNN in ship lounges, mess halls and work spaces. "It is clearly propaganda aimed at trying to show that America is anti-Islamic," Lt. John Oliveira, the ship's spokesman, said. "I think over the last three months of this campaign, the United States has shown it is not anti-Islamic. We are anti-terrorism." The videotape was filled with Islamic parables and words dedicated to the hijackers. Bin Laden praises the Sept. 11 attacks and defends what even he calls terror against the United States. "Our terrorism is against America. Our terrorism is a blessed terrorism to prevent the unjust person from committing injustice and to stop American support for Israel, which kills our sons," he said.